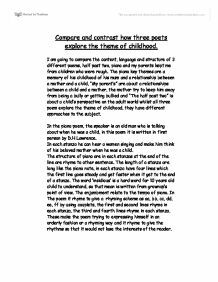 Compare and contrast how three poets explore the theme of childhood. 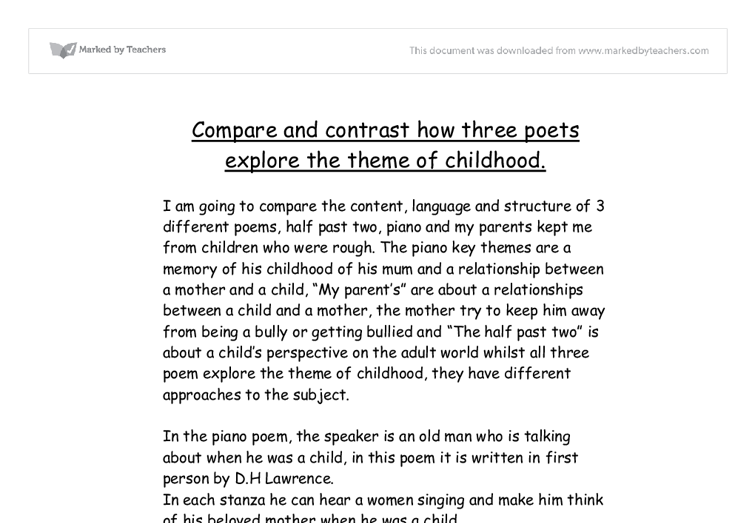 I am going to compare the content, language and structure of 3 different poems, half past two, piano and my parents kept me from children who were rough. The piano key themes are a memory of his childhood of his mum and a relationship between a mother and a child, "My parent's" are about a relationships between a child and a mother, the mother try to keep him away from being a bully or getting bullied and "The half past two" is about a child's perspective on the adult world whilst all three poem explore the theme of childhood, they have different approaches to the subject. In the piano poem, the speaker is an old man who is talking about when he was a child, in this poem it is written in first person by D.H Lawrence. In each stanza he can hear a women singing and make him think of his beloved mother when he was a child. ...read more. Where it said "Something Very Wrong" it starts with a capital letter of each word this is for emphasis. The child knows a lot of time "Getting up time, time you were offline and T.V time" but he doesn't really know the Actual Time like the "half past two time", you can tell that the boy is about 6 or 7 years old because of him not being able to tell the time. It is written in third person. In this poem have eleven stanzas which have four lines in each stanza, the first stanza of half past two begins with "ONCE UPON A SCHOOLTIME", which it's already tell us that the poem will gives you the impression that the rest of the poem will be in quite a childish way of talking and also creates a kind of fairytale atmosphere. In the half past two are presented though language. In language is used personification in the last line of the poem "Where time hides tick-less waiting to be born". ...read more. "They ran in the street and climbed cliffs and stripped by the country streams" it seem to me that the child in the school are naughty acting like an animals. The mood of the poem that the reader is left with were that the atmosphere changes when the child was feared "I feared more than tigers their muscles like iron And their jerking hands and their knees tight on my arms", it make the reader feel like something is terrifying going to happen to the child but towards the end the mood changes into forgiveness which when he said "I longed to forgive them, yet they never smiled". The metaphor is used to create the atmosphere of fear. In conclusion the three poets presented the childhood all in a very different situation way, but the same key point. All of them had some related features as well as contrasting. The language has relate structure of the use of comparisons in piano and my parents kept me from children who were rough while fanthorpe's language is completely contrast to the other two poems. By Eve ...read more. The ancient Greeks made medicinal use of plants. Greek medicinal practices, as preserved in the writings of Hippocrates and - especially - Galen, provided the pattern for later western medicine. Hippocrates advocated the use of a few simple herbal drugs - along with fresh air, rest, and proper diet. During 1997-98, an El Ni�o Southern Oscillation caused drought and fires, a combination of factors, which resulted in the destruction of large areas of Sumatran forests. During that period, tigers fleeing burning areas near Berbak National Park were reported to have killed several people. She accepts her death with equanimity:"to meet this fate is no pain at all"6. Sophocles crafts Antigone's philosophical reasoning as a way for the audience to admire and agree with her rather than with Creon's laws. The stichomythia7 between Creon and Antigone serves to present the opposing views of both characters and their certainty of the righteousness of their actions. Once again in last place, Haagen ~ Dazs comes in with an artery-clogging number double the amount of the other ice creams at 4 fat grams per ounce, the same amount as greasy McDonald's French fries2. In the next measuring factor, cost, we find Bloom in the lead once again at a small cost of just $0.05 per ounce. explains that they are used to relax and let go of inhibitions to let yourself truly enjoy the experience but some people do not partake in drugs at all and share an equally enjoyable time. Drugs at the OCF seem to be used as entheogens to further lose one?s self in the experience.